The booking system is easy to use – both for you and your customers. With the various features that our standard system offers, you have the opportunity of creating your own personalised layout, make different kinds of bookings and easily control your booking settings. Our standard system offers you easy access to all of your calendars. With this feature you can view all of your booked appointments in a clear and easy calendar view. You can choose between a monthly, a weekly or a daily view. 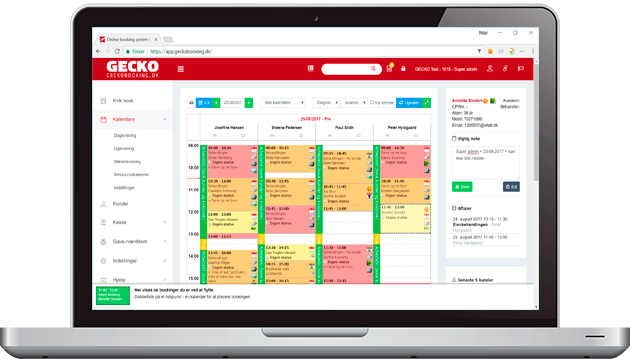 If you need more features than the ones our standard system offers, you can explore Gecko Bookings add-ons. Here, you can purchase add-ons such as online payment, cash register system, gift vouchers and journals. This gives you the opportunity to tailor your system to yours and your customers’ needs. 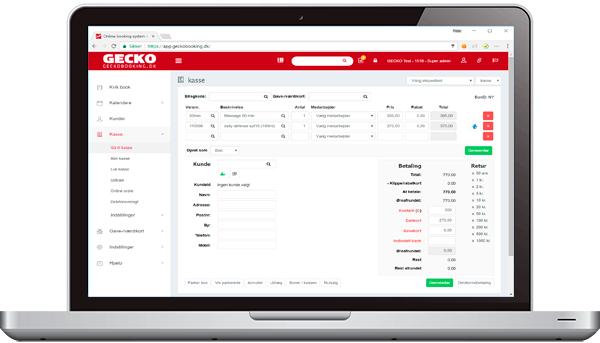 GECKO Booking is platform independent, meaning that it supports browsers on PC, Mac, Linux, mobile phones and iPad’s etc. .
For some time, I had been searching for a booking system that could meet our special needs. Finally, I choose GECKO Booking, which I have not regretted for one second. The more I work with GECKO, the more I get surprised at how they can customize the system to my needs. We are very satisfied with your booking system, which have saved us a lot of time because the customer can book crane lifts at home. We strongly recommend your booking system. 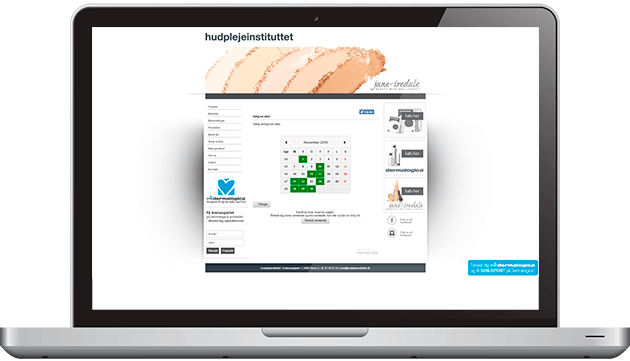 Today all our customers are very happy about the system and use it frequently to book ‘Senetens’ treatments at Skovshoved-Goodlife.dk. In other words, we can only recommend GECKO’s online booking system. Without it we would not have been able to handle our success the way we did. 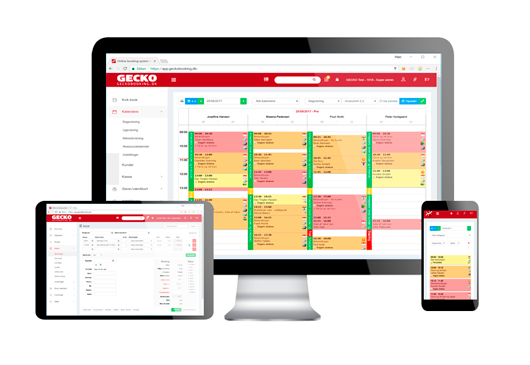 At Lægernes Sunheds Center we have used GECKO Booking’s standard system for a longer period of time, and we find the system easy to use, intuitive and with very competitive prices. Since the beginning of 2014 I have used GECKO Booking and their journal system. I am very happy about the booking system, which is easy to use and provides you with a clear overview of your appointments. It saves me a lot of time to have a clear system where we have registered all customers and these registrations are easy to access. In the online booking system you have the option of creating multiple therapists and more treatment types. Any therapist can control which treatments he/she offers and at what times. In addition, the therapist has access to his/her own calendar, which can be updated by both the therapists themselves and by new incoming bookings from the website. I will certainly not refrain from highlighting our satisfaction with a simple, flexible and clear booking system. Easy access to support and adjustments is a must, if the working day should not stop when disruptions of technical character occurs. Approximately 6 months ago we switched to using GECKO Booking. We have not regretted it for one second. All our therapists have their own calendar and we can quickly get an overview of all bookings. Our customers can book an appointment online with the therapist of their choice, which makes it a lot easier for them.